The American Dance Festival and the Nasher Museum of Art are doing an extremely cool thing, co-presenting an unusual dance by Mark Haim in the museum’s atrium. There were two shows of This Land Is Your Land on the 25th, and there will be two more tonight, June 26. After that you will have missed your chance to see something surprising, life-affirming and–yes–cheerful. Mark Haim, from Seattle, has been teaching in the ADF School for years (and has been an artist-in-residence at Durham’s Cassilhaus), and has a long, impressive roster of work to his credit. He is one of the 14 (Seattle-based) performers who walk, skip and turn before a striped backdrop, moving unceasingly through a series of permutations and modulated repetitions that would make Philip Glass goggle. Although the sound was a mix of country and western songs, old and new, I felt as if I were seeing music being made in the minimalist style of Glass or Reich. It was a fantastic feeling. From Mark Haim’s THIS LAND IS YOUR LAND. Photo: Tim Summers. The 50 minute piece has to do with contemporary city life, its river-like qualities of homogeneity and sparkling difference. 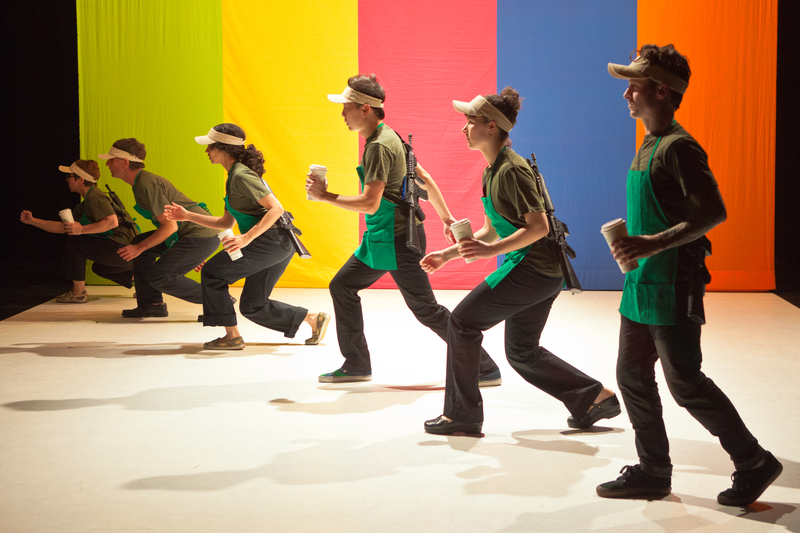 The dancers appear from one side of the striped curtain, walk the line outward, turn and reverse, taking up the next position on the return, when at the same time the outermost dancer exits past the trash can, tossing in the Starbucks cup, beer can or drink cup with which each is supplied nearly all the time. They do not interact at all until very near the end, but, like fish in a river, they move near and past each other. As the dancers cycle out of our sight, they change something–cup, cap, shirt, shoes, phone, gun, etc., and the movements and tempo in the walking alter slightly with each change. It is pretty brilliant. And not even the tiniest bit self-indulgent or self-absorbed. The end could be stronger, and for some reason the last song is “Great Speckled Bird,” not “This Land Is Your Land,” but those are quibbles. This is a portrait of America that makes the bleak failings absurd, and the bright strengths joyous. We just need to keep on walking, and changing in a rainbow world. The Nasher is small venue. There is a very limited number of chairs, and limited sitting/standing room beyond them. If you want to go, which you do, calling ahead for a ticket and getting there early are both advisable.